The elementary music program at Saint Patrick School provides a foundation in musicianship, theory, history and vocal music. 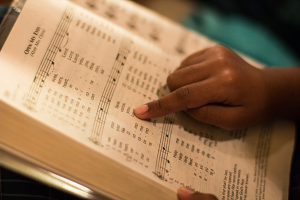 A meaningful experience is provided through the regular participation in sacred music in a liturgical context and in performance in school concerts and assemblies. Write and recognize by sight all notes, note values, rests and parts of the staff for both treble and bass clef. Sing accompanied, a cappella, unison and two-part songs with a focus on healthy vocal technique. Recognize instrument families and the appropriate uses of individual instrument sounds. Participate fully in the mass and prayer services through vocal music. Develop a liking to actively listen to music, an interest in music history and theory, and a joy for making music. Be fully prepared to find success in the choir and/or band programs at 4thgrade with strong musicianship skills.